Folic acid (400 mcg/day) or Folate is an essential Vitamin required almost 12 weeks before you conceive and also during the first trimester (first 3 months) for the growth and development of the brain and spine of the fetus. Folic acid is also required throughout the Pregnancy for the formation of blood. Its deficiency can lead to anemia in the mother and malformation in the fetus such as neural tube defects. Raise your folic acid levels be enjoying recipes made with. 1. Vegetables like potatoes (with skin), tomatoes, spinach, peas, broccoli, beetroot and ladies finger. 3. A variety of cereals and pulses along with sprouts. Want to know how to cook healthy with these folic acid rich ingredients during pregnancy? Peep into this section as the recipes here have been researched just for you. Try them all to stay healthy, especially in those beginning months of gestation, as folic acid is required during the initial phase of pregnancy. Tava Chana is a wonderful recipe to be had for snacks and is better than consuming roadside chana. This recipe is also rich in protein, calcium, magnesium and phosphorus. Moong Dal and Spinach Soup is perfect snack if you want to have something light, its like having good health in a bowl with brimful of protein, vitamin A and iron – all of which will make your eyes sharp and keen. Chick Pea Tikkis is yet another healthful snack to support a healthy development of your baby. This tikki is rich in protein and calcium. Have it with your choice of healthy chutney. Including healthy subzi’s is of utmost importance during this critical phase of life. Here we bring you lip-smacking subzi recipes sure to make you feel good. Broccoli, Carrot and Paneer Subzi has an unusual combination of veggies and makes this simple vegetable stir-fry seem quite exotic! Broccoli is a very good source of folic acid, vitamin C, vitamin A and fibre, while paneer contributes calcium and protein to this dish. Gavarfali ki Sukhi Subzi is a yummy dry subzi that combines beautifully with hot phulkas fresh off the tava! The benefits of fibre-rich cluster beans are enhanced by the introduction of flavour-imparting garlic. Cauliflower Greens Pitla is a unique recipe where cauliflower greens have a crunchy texture and fresh flavour and also are iron-rich which adds to the iron and vitamin C content of besan. Cauliflower Greens Pitla will surely make your skin glow by improving blood circulation. 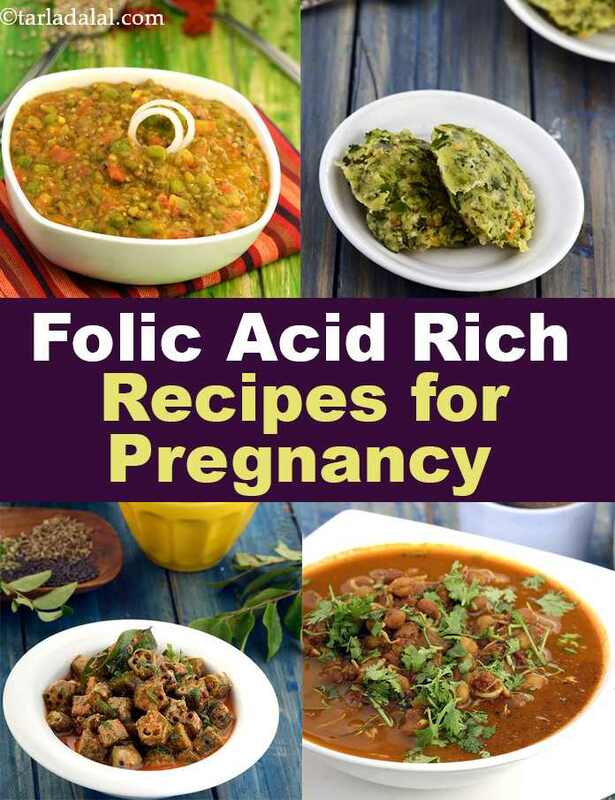 Enjoy all our folic acid rich recipes for pregnancy. Explore more varieties in our pregnancy section everyday. This is one of my all-time favourite soup recipe which is also very nutritive as it is rich in vitamin A, fibre and protein. Instead of fried starters, this "sunny" soup is just perfect for a pre-dinner appetizer.